Unlike my last post, the 1951 Clyde, I know plenty of people that share a name with my latest project watch, a 1965 Arthur. In fact, I wonder why it took 40 years to get around to using that name? They never did get to my name, Daniel, oh well - I'll have to settle for the Boone or Webster, I suppose. The Arthur was introduced in 1965 and produced through 1969. The Arthur came in a 10K yellow RGP case with a stainless steel back. You had your choice of a matching bracelet or a Hamilton strap. The embossed white dial features an interesting linen pattern that I wouldn't want to have to get refinished. Inside the case is a Swiss-made Hamilton 686 movement. I recently landed a Arthur and it arrived with an aftermarket bracelet and one of the lugs bent at an odd angle. I was able to put the lug back into it's proper position so all four lugs look like they should. The back is engraved with a presentation to a grand pooh-bah of some sort of a Masonic lodge in up-state New York. I was able to google the recipient's name and found out he was born in 1910 and passed away in 1991. Where this watch has been for the past 24 years is anyone's guess, but his wife passed way in 2010, at the ripe old age of 98. Without the crystal in way, you can see that the dial is in excellent condition. The 686 movement look bright and shiny but I don't see any watchmaker's marks in the inside of the case back - so I may be the first person to have laid eyes on this movement since 1965. While all the parts are being cleaned, I'll prep a new PK (low profile) crystal for installation. 30.0mm will do the trick. Everything is cleaned and dried. The trickiest part of putting this movement back together is to get all four wheels to line up at the same time so the train bridge falls into place. Once that's done the rest is a breeze. The movement is now ticking away with good motion, that's a good sign. The beat error is a little high, especially for a movement where the beat error is so easily adjusted. Of greater concern is the little bit of extraneous noise that is affecting the lower of the two lines. I'll reclean the balance and then adjust the beat error. Here you can see where I've tweaked the hair spring stud position and gradually reduced to the beat error so that the two lines are right next to each other. 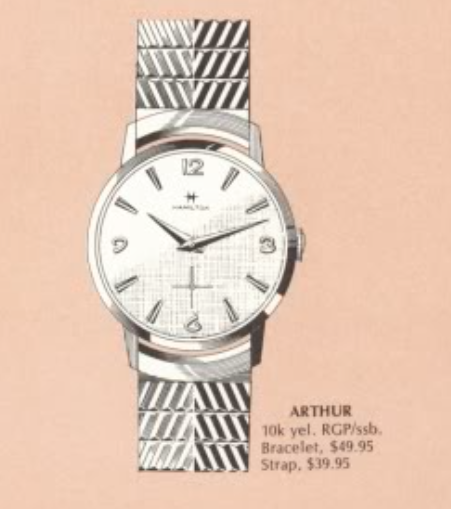 With a new strap and crystal, this Arthur looks like it just left the Lancaster, Pa factory. It's a good sized watch too - probably 34mm in diameter, which is large for a vintage watch.